This is the small stack of books from this week. The Big Stack consists of books I picked up at ConFusion 2019, which is a large enough collection that it warrants its own post. 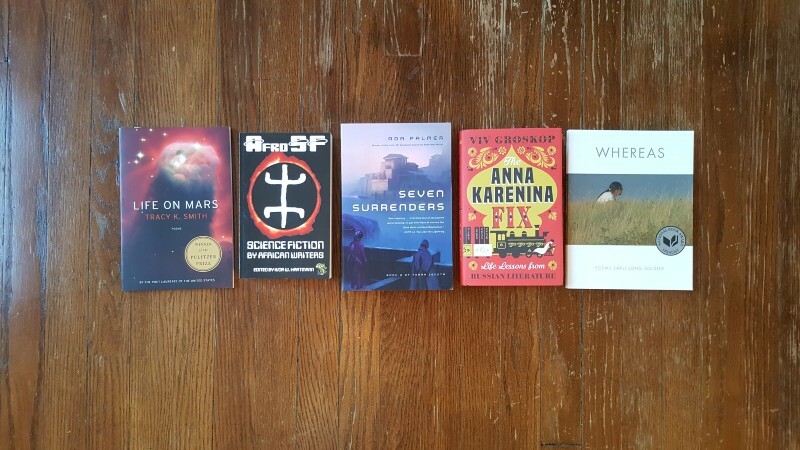 The books on the ends, Life on Mars and Whereas, are poetry books I purchased on a whim while at Books and Mortar picking up AfroSF and Seven Surrenders. The Anna Karenina Fix arrived from Amazon while I was at ConFusion. In reading news, I finished Too Like the Lightning by Ada Palmer while at ConFusion on Thursday night. Friday morning I had coffee with Miss Palmer and several other people, where she held forth on various Papal shenanigans from the mid-1400s. To cool my head I read about half of the poems in Life on Mars, which is an absolutely wonderful collection by our current national Poet Laureate Tracy K. Smith. I am now a little more than halfway through Fix by Ferret Steinmetz, the sequel to Flex and The Flux. Thus far it is just as good as the first two. I expect to be finished by the end of the week and am enjoying every page of it.